You may remember the launch of the first Macintosh in 1984. Steve Jobs said “today, for the first time ever, I’d like to let Macintosh speak for itself,” and the computer replies..
Then in the 1990’s we had ‘Plaintalk’ and ‘Macintalk’. These were attempts to make the Macintosh computer human. There was also ‘Speakable Items’ where you could dictate short commands to the Mac. In OSX 10.8 (Mountain Lion) Apple introduced “dictation.” It was basically an OS X version of ‘SIRI’ where your speech would be sent off to a server to be recognised and the text would come back to your computer. In OS X 10.9 (Mavericks), for the first time, there is a usable speech recognition engine built-in to Mac OS X. There was not a lot of fanfare about it. In fact it almost comes as a hidden feature. 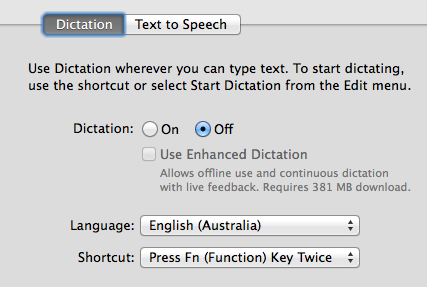 You need to turn it on by enabling a mode called ‘Enhanced Dictation’ in the System Preferences. Despite this understated introduction, I think it’s one of the best things about OS X Mavericks. The only thing lacking from the built in Mavericks dictation is correction. If correction arrives in the next version of OS X, it will be a game changer. The one major flaw: No correction. Mavericks Dictation would be to be very painful to use as a long term solution because there is no way of correcting mistakes and therefore helping it to learn. If there is a word it gets wrong, it will be getting it wrong forever. It works OK for me, but if it made any more mistakes that it did it would be un-usable without a correction and training feature. 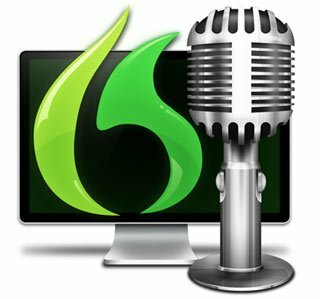 One of the redeeming features of speech recognition software like Dragon Naturally Speaking (on the PC) and Dragon Dictate (on the Mac) is that even though it makes the occasional mistake, it has a correction feature. If you correct a word it will learn from this. The more mistakes you correct the better it gets. There are lots of articles comparing the accuracy of Dragon dictate with the built in OS X dictation. But most of these articles fail to address this important difference. For example here at macworld they state that the accuracy of Dragon Dictate is 96.6 percent and for Mavericks’s Dictation is 89.6 percent. But no mention that the Mavericks has no learning ability. Here they compare the speed of dictation between the two programs. Again, they miss the biggest difference. The biggest difference is not the accuracy or the speed. The biggest difference is the ability to learn. Accuracy and speed can both improve as the software learns to adapt to your voice. This means that Dragon Dictate will continue to improve as you use it. The OS X built-in dictation will continue to be stuck with words it doesn’t understand. If you are thinking of speech recognition, the built in Maverick’s OS X speech recognition might be a good trial. If you like what you see, go and buy Dragon Dictate. If you don’t like it, stay away! By default the Dictation seems to be similar to SIRI based speech recognition. It sends your speech over the Internet to Apple to be recognised. But the OS X dictate has an option to download the speech files and then recognise your speech locally like Dragon does. To enable this you need to go into the System Preferences. Under “Dictation” there is a checkbox called “use enhanced dictation.” If you check this box it will download the speech files that you need. If you are going to attempt to seriously use the built-in OS X dictation, I suggest you get yourself a good microphone. You really need a good headset microphone with some noise cancellation that is either Bluetooth or USB compatible. I suggest you check out knowbrainer.com. I got a great Samson wireless headset from them. The built-in Mavericks OS X speech recognition is in my opinion a good trail. It is almost as accurate as Dragon Dictate and will give you a feel for speech recognition provided (1) you have a good microphone and (2) you are expecting it to be a trial, not a viable long term speech recognition product. 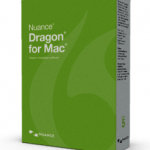 It sounds like Nuance’s Dragon engine is what powers SIRI. If that’s the case, if Apple add correction to their Dictation app then Nuance’s Dragon Dictate would become completely obsolete. It will be interesting to see what happens in the future with Apple’s Dictation. My suggestion is to try out OSX Dictation (in Enhanced Mode), and if you like it, go and buy Dragon Dictate. I have recently purchased a MacBook Pro Retina (unbelievable graphics!!!) and decide to try Maverick’s Dictation. To say I was disappointed was an understatement! I found that the time taken to go back to find and fix the mistakes probably took longer than typing the text in by hand. The real annoying part is that I can not train it to prevent it from making the same mistakes over and over again. In the past I have used Dragon Dictation in Windows. Okay, it took half an hour of reading to have the computer recognise my broad Australian drawl. Each time I used it I would correct the mistakes. After a week or so I was down to one or two errors per page! Give me Dragon over Maverick’s any day. Reading how Apple strives for excellence, the concern I have is that in future editions of Maverick’s, Apple might include a “learning procedure”. If so all that money for Dragon might be wasted. Even still I think I will purchase a Mac version of Dragon and educate my MacBook Pro so it performs even better. While I really do appreciate the time you spent comparing the different types of word recognition and I can see the benefits of both, I am really surprised that you, as a writer, would not take the time to grammar or spell-check your work. It seems that you’ve come to rely on the dictation software just a little too much. I won’t point out the several mistakes (and I’m talking about in the main article, not the text on the video thumbs), but if you even re-read it, I’m sure you’ll find them. I am one of those people who feels it’s important to preserve at least reasonable writing or it will go the way that the “educators” are taking cursive writing: out of the system–another mistake. In any case, enjoy your Samson! Oops – thanks. I’ll have a look at that! Does anyone know if there’s voice recognition that can be used to express commands to videos on YouTube? Say basic stuff like, pause, play, etc. How is it with Yosemite, has Dictate improved? Apple says, the recognition would “learn”, is this true and if yes, does this apply for the online or/and the offline-version? Yes has improved very much with accuracy. It’s quite amazing out of the box. It seems pretty much on par with Siri and it seems more accurate than Dragon out of the box. But there is still no correction. So although it is better, it cannot learn by you telling it to correct your mistakes. For example it will not recognise me saying “Yosemite” and there is no way for me to train it so I simply cannot dictate the word “Yosemite” to it. With dragon I can train it to words it doesn’t know and it learns them. now that it has been pulled I am desperate to know about it.